Losing the Groove: What Happens When…? What happens when you step away from a particular embroidery project for a long, long time? For me, I lose the groove of the project. The touch. The feel. The rhythm and instinct that comes with repetitive methods. Usually, it takes me a little bit of stitching to get just the right rhythm and flow of work going again. It’s been a year and a half since all the letters in the Stitch Sampler Alphabet were finished, I blush to admit! But I’m not finished stitching them, I find. And it’s not because there are more than 26 letters in the alphabet these days. That, at least, hasn’t changed! I’ve had to go back and re-stitch a couple letters, for different reasons. Did I mention it’s really, really green? For the e-book (coming soon! ), I want to present an alternative H, on a different background. I also want to dress up some of the stitch combinations in the original H.
When I sat down to embroider the new sample, I noticed something. It wasn’t quite as easy, it wasn’t quite as fast, and the stitching looked somewhat different. It seems to me that, when you work the same kind of project over and over again, you develop a kind of feel for it, and you also fall into a bit of a rut. Things start tightening up and becoming mechanical. When you leave the project for a while (in this case, a long while!) and then come back to it, the mechanical, repetitive part is gone. The approach becomes looser, slightly different. Am I the only one who’s noticed this? I doubt it! In one regard, this is a good reason to step away from a project for a little while and take a break, especially if it’s beginning to feel too constrained. On the other hand, if you’re trying to create a complete series of stitched items, you do want a little continuity in the look. Luckily, with these letters, the continuity comes from the design and approach, the various stitch combinations, the style of the letters, and so forth. A little freer stitching, a little looseness in interpretation from one letter to the next is not going to ruin the series. On this particular letter, I’m using a completely different type of linen, compared to all the different linens I used on all the other letter. And while this one isn’t a favorite-favorite for surface embroidery, it is a surprisingly good option for this particular embroidery, despite the fact that it’s a relatively low-count linen at 25 threads per inch. Because the warp and weft threads are mighty plump and round, the fabric works well for surface embroidery, as long as you use a crewel needle and stitch straight through the fabric threads while you embroider. You might be attracted to the little holes around the intersections of the woven threads, and you can use them, but for surface work, you really want to pierce through the fabric threads and not rely solely on the holes formed by the weave. For thread, I’m using coton a broder #25 in a variety of colors, with a #7 crewel needle. It’s working great! So, with the new H almost finished, I’m one big step closer to finishing the Stitch Sampler Alphabet e-book – just in case you took me too seriously last week when I talked about Late Harvest and not getting anything else done! I’m close enough now, that I’m setting a semi-firm goal of launching the book by Easter. I’ll have more details about it in the weeks to come! Good Monday Morning Mary – SO looking forward to these patterns! LOVE monograms and alphabets and samplers and your newest patterns will accomplish all of these for me! Thank you so much for all you do for ‘us’ stitchers! My goodness, when you say green you really mean GREEN! Yes, I find my stitching takes time to warm up if I’ve stopped a project for a while; I have to get back into the rhythm. (True of most hand/eye skills, I find.) I also wonder if the slightly looser and larger-scale white linen made you work looser and larger scale stitches in harmony – fabrics do affect us more than we think. Which is good – if there’s no ‘feedback’ from the fabric to the stitching, something is missing in the marriage of fabric and thread that is the heart of embroidery. Good point, Sue! I think you’re right – the fabric has a lot to do with it. I put a little time in on this again this morning. I find myself contemplating changing the fabric, actually. It works, but it doesn’t photograph so well – it looks so very bulky in the closer-up photos. Yes, GREEEEEEEN. I actually love that fabric, but it’s too much when featuring some 12 or so close-ups of it! So relieved to hear that you too have project albatrosses! On the flip side of getting out of a groove — sometimes when I look at previous projects I did, and maybe try to do something similar, I wonder how I actually DID it in the first place!! I am amazed! LOL! Yes, me, too, Bobbi! I am amazed at all that you do manage to get done!!! I know exactly what you mean about getting back into the groove especially picking up pieces that have not been touched for a long time..trying to match up isn’t easy. I play around on what I call a “crying towel” doing a few stitches to test out my tension etc before actually working on my piece. It helps me. Sometime…when you have time haha…do address the problems of elderly stitchers. Our hands change when we enter the 60s on up, some have arthritis and other just don’t have the dexterity…just holding the needle is different. I am 85 and luckily my eyes are still good but maintaining smooth stitches takes me a lot more time (satin stitch)especially in floss and silk. I use Appleton crewel wools and find my creweling still looks good. I am my own worst enemy so may be too hard on myself. 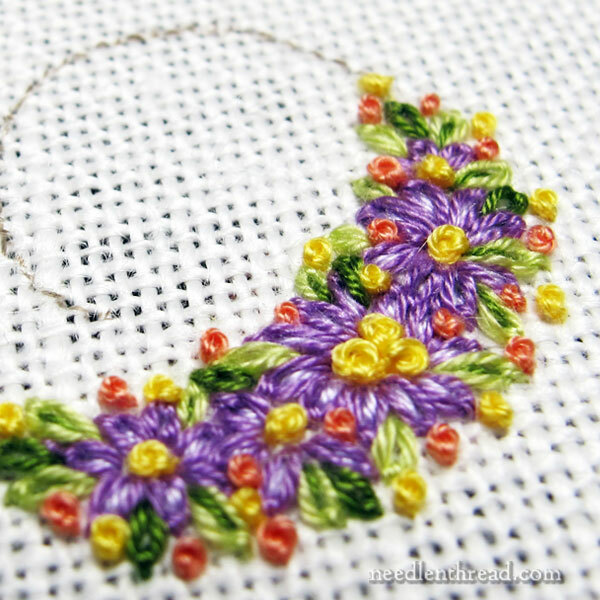 I am sure you can come up with ways to help all the older lovers of embroidery stitching. Good morning, is there any chance you can offer the Stitch Sampler kit bundled with the ebook? It would be wonderful to be able to order everything I need to make the sampler with one simple click 😉 I will be first on the line. Oh, as much as I’d love to, I don’t have the facilities for packing kits and so forth right now. And each letter is different – different colors, different ground fabrics. These are meant to work well as “stash” projects. You don’t have to use the same threads or fabrics I use (though they are listed in the book); instead, you can use what you have on hand or select your own favorite color schemes. If you could please tell me what kind of silk thread can I use,please help. I love this site and I love your sense of humor. When I surfed onto your site I knew I was going to like you but now I love you. I am a 68 year old woman who suffers a lot but next month I am having my hip replaced and I hope to start doing some of the things I used to do. Keep up the good tips–they give me so much hope. Hi, Susan! I hope the recovery from hip surgery is swift and that you are up and at ’em in no time! I’m glad you enjoy Needle ‘n Thread. We do have fun, don’t we? Good luck with the hip replacement! Hullo from across the Atlantic Mary! From my little island (Guernsey) off the coast of France where embroidery materials are so few and far between, I relish reading your blog each day. When I saw in my emails today that it was an entry on the Stitch Sampler Alphabet project I nearly squealed at my computer in the office (it’s lunch time here!) which would have given my colleagues quite a scare. Really looking forward to the release of the e-book. God speed! Hi, Gracie! Ah, Guernsey – I have always wanted to visit the Channel Islands! What a rich history surrounds you – and beauty, too. I’m glad you didn’t squeal aloud…. but I give you permission to squeal when the book is finally finished. I’ll be squealing from Kansas – you might even hear me all the way across the pond! I too got lost and 4 years later finally realized that I didn’t like my choice of stitches or colour. It is an alb upon which I’m embroidering a band on the hem and sleeves in a red seasonal motif. I’ve totally changed the size and thread choices and am FINALLY proceeding. It’s wonderful that my son has patience. Hi, Sue – this happens to me a lot! I stall on a project because, deep down, there’s just something I don’t like about it, even if I can’t put my finger on exactly what I don’t like. And then, when I finally get up the gumption to make a change, I find it’s much, much easier to move forward. I’m glad you’re going forward with it – I’m sure it’ll be beautiful when it’s finished! When I step away from a project for a long time, it’s very hard for me to regain interest. I have a crewel wildflower kit started and has been languishing since my high school days (yikes – almost 40 years!) and a cross stitch of Statue of Liberty for about 5 years. The crewel project – I still like it, but due to my inexperience/impatience at the time, now I think parts of it should be redone and where do I find the yarns? The cross stitch – I come to realize just don’t care to do cross stitch all that much (love the results though). I still haven’t found a way to get myself back to working on them. I love the bright green in the original H. but I must confess it would be a surprise to turn the page and see it in a book – it seems example photos are almost always done in white or other light neutral color. What about a small section of possibilities – include the original letters you are redoing, plus some photos of different color fabrics and threads (not worked up, just showing the combinations) to give some ideas to those who might be a bit timid about going bold? Hi, Gail – Yep, that’s the plan. I’ll show the piece, but I won’t use it for the multiple close-ups. There are a couple stitched on red as well. I’m not sure if I’ll re-do those yet or not. Thinking about it, but not convinced. These aren’t actually instructional photos. They’re just samples of finished letters. The instructional photos are all on white – much easier to see! I’m so excited for these! They look beautiful already, and I adore monograms. Particularly because I’ve not been sewing for long I find work completed a few months ago looks like it was done by someone else entirely! I embroidered a little hoop with a quote on for a friend who now quite wants another and I really think I’ll have to replace the first, too, for exactly that reason. I suppose at least I can be sure I’m making progress! They sound like fun projects, Alice. I love embroidering quotes! I agree that you get a continuity and a certain “look” with a series done repeatedly. You get a chance to go along with the project’s unique place and the detours are special to that project. It makes for a lovely collection. Yes I know what you mean when you leave a project and return after a long time it’s like starting a new project and a different approach, which can be an advantage. I’m so glad you’ve nearly finished the alphabet e-book I can’t wait to purchase it and browse through all those letters with your wonderful stitching techniques which I know will inspire, I do hope you finish by Easter which would be a nice Easter surprise. I like the different coloured fabric and the green is colourful although bright is very nice. Thanks for sharing your progress on the alphabet samplers and for the update on when it will be finished, keep up the good work looking forward to it. I loved seeing that alphabet, and can’t wait for the e-book. Thanks for sharing your struggles, which I can so relate to. I was the very appreciative, fortunate winner of the Breath of Spring kit that Mary so kindly sent. I wanted you all to know that I started the very day I got it in the mail and have been having so much fun! I did have to put aside the Hummingbird project to work on this one. I wanted you to know that I am loving stitching every leaf and bug and it isn’t sitting in some drawer somewhere. I love all your comments and encouragement for each other. Someone showed me a book of Stumpwork and Embroidered Beetles by Jane Nicholas. That will be my next project but I promise to finish the gift of Breath of Spring! 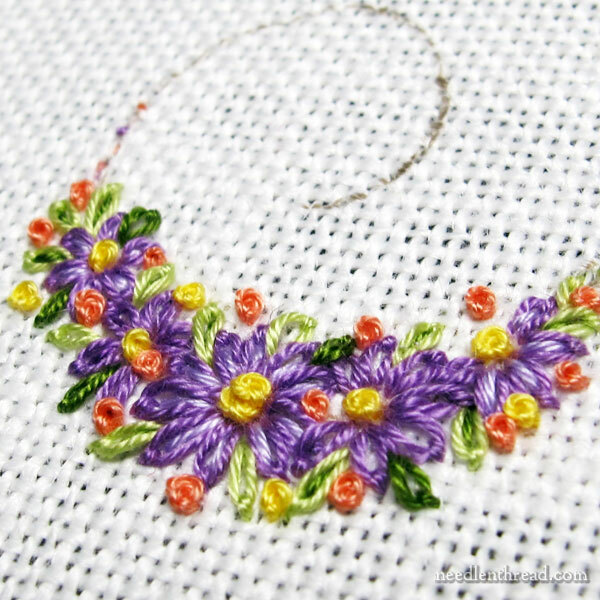 It snowed again this morning so embroidering flowers is so cheery! Thank you Mary for your humour and wonderful daily letter. So glad you’re enjoying it, Robin!! It’s perfect for chasing away winter blues! How wonderful to see spring flowers when it’s -10 below here in Michigan. I’m so excited! I’ve been waiting as patiently as possible for the alphabet to come out. Ever since you did the article on the compacts I’ve been thinking about doing them with monograms for family members for their Birthdays or Christmas this year. I was wondering what size the letters actually are. I can make the patters any size I need but I’m not sure how they will stich out that small. It’s strange for me to say since I’m not a fan of green but I did like your letter stitched on that bright green. The flowers looked like they were scattered on a freshly cut green lawn. Not a bad thing. Ireally like your work and your site it is always a pleasure to read you,.I have a question.Is there anarticle somewhere to hepl us match some color treads for paint embroidery,I am doing some poppy flower,manadge to put up a palette but was wandering if there is something out there? Hi, Diane – I don’t have a color palette for poppies in particular. I think the new Inspirations Magazine issue has a nice poppy in it, though. You might find it in there. It’s the one with the big poppy on the cover. You can buy individual copies in the US through Wooly Thread. It’s issue #85. I don’t know if they have it in stock yet, but they might! Worth checking…. Poppies are popular right now in the fabric stores. You might try looking for a piece of fabric and then matching the colored threads. I also keep a sash of poppy related things since I am a life member of the VFW. If you Google Flanders Field you will find some beautiful poppy fields to look at and then you can choose accordingly. Red with black centers and California is poppy golden yellow with green centers, if that helps. from Needle ‘n Thread and I have a question. 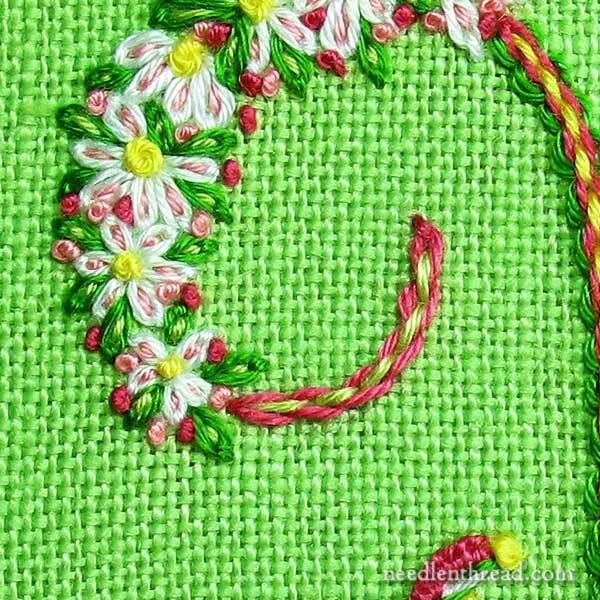 I would like to use the Whipped Backstitch on some pillowcases, however, I do not have any Coton a Broder and am wondering if it is possible to use DMC floss. If you think this would work, could you recommend how many strands of floss would work best. I appreciate your consideration on this. I, too, am looking forward to the ebook for your Stitch Sampler Alphabet. Last week I purchased your Cast on and Double Cast on ebook and the photos and instructions are wonderful and clear. Have a great day. Hi, Louisa – Yes, it’ll work great! It depends on how heavy you want your line. I’d say start with two strands for both the backstitch and the whipped stitches. If you want it heavier, go with three strands of each. Losing the groove can be frustrating! I find this happens most often with hand quilting and embroidery, for me, at least. My solution is what I call a “warm-up” piece: I keep a 14″ quilting hoop and an 8″ embroidery hoop loaded so that I can stitch a bit to get back into the feel for the real thing, and then I move on to the actual project I’m working on. For example, I’m working on a quilt that has LOTS of tight, curved feathers, and even a couple of days away from it seems to impair muscle memory. I can “waste” uneven, inconsistent stitches on the warm-up piece and don’t have to pick out stitches from the real piece. It’s a timesaver and a lifesaver! I have a few projects that have been put aside. Mostly I have learned the technique but was not really thrilled with the project. Some have been interrupted by life and have not been able to get back to them. Guess I should clean house someday. I have been happy to stitch most of my life. There is always something else to learn. I think “stepping back” is a good idea in any art work. I know it helps with my quilting, although I wish I could get in the practice of making notes of what I had in mind before I put it aside. I look forward to you alphabet ebook! Also, I enjoy your daily articles so much! Here is my ‘Step Away’ story. It is short and well, something. I started a cutwork piece, a pillow cover, but was unable to complete it. That was. 40 + years ago, I finished it last week. I am not ashamed! There. I’ve been working on a very finely embroidered Elizabethan box for some years but all last year, my stitches have not been up to my usual standard. The problem is cataracts in both eyes!! So I have had to put fine embroidery aside & concentrate on KNITTING until an eye operation in March. Then I’ll have to have a critical look at my stitches & re-do anything not up to standard. KEEP GOING!! Oh, sorry to hear it, Patricia! I hope the surgery goes well. The world will look brand new, from what I’ve been told! Knitting is a good substitute! Thanks, Lidas! I’m glad you enjoyed it! I don’t like the vivid green fabric but I really like the embroidery colors and the filled chain. I have a large project that I come back to and do a bit and leave for awhile. Im relatively new to embroidery so I like that this project is my creation and I can do whatever type of stitching I like but the stitches on some parts needs to be the same on other parts… Like leaves for example. I do notice what you mentioned in your post happening when I come back to do more. Im really looking forward to your alphabet. It looks very fun. Hi Mary, You are right, the rhythm goes. But I find that when I have to put a piece of work away even if for just a few days, the enthusiasm and motivation has also dwindled. I have to force myself to get back into it. Having to put work away accounts for about 80% of my U.F.O.s. The others are ones where I grind to a halt because I am stuck. When I get a possible solution, the piece comes out and the enthusiasm is there once more. And the piece I was already working on gets put away. Another U.F.O.! 1) I HAVE BEEN RECEIVING YOUR MAIL FOR THE LAST YEAR AND LOVE EVERY ONE. COULD YOU PLEASE HELP ME LOOKING FOR MATRIALS THAT YOU USE, OH DEAR NOW THE THING. CAN YOU HELP WITH A EMAIL ADDRESS OR NAME OF SAMEONE HERE IN SOUTH AFRICA THAT CAN HELP ME WITH MATRIALS AS I FIND I CAN NOT GET THE SAME NAMES HERE. Hi, Dennis – I’m not sure of the suppliers and the supply chain in South Africa. I think your best bet is to contact a shop, a guild, or a designer in your own country, to see if they can help you. I totally agree with your analysis. I notice that the first few stitches I have t work at finding the same tension and find my rhythm again. I rather like the apple green, but I understand your need for consistency for the book. It will be fabulous when it is ready and I am looking forward to it. BTW, I finally finished my ongoing cross stitch that I wanted to have finished last year. Better late than never I guess, but now I can begin some surface embroidery without guilt. Oh, I’m so excited! I will be one of the first to purchase your new ebook! Can’t wait! So glad you are sbout finished…been waiting! Will you have excerpts from the book first? Like a little sneek peek? I know this will probably be one that is downloaded and since I am old and way behind on my computer skills, please give us all the info for doing this. Thanks gobs! Oh yes, I’ll explain what’s in it and all that – along with instructions for download (which is quite simple!). Dear Mary, I love your designs and am looking forward to seeing the different versions of the H. Re: the close-up photos of the green version — could photoshop allow you to change the background color? (Not in reality, of course 😉 Would that change the ‘bulky’ appearance you mentioned in a comment above? Thanks, Kathy! No, no pre-orders, I’m afraid! I’m still pushing to a pre-Easter release, but the tax man calleth, so I have to take a break and take care of paperwork….rrrrgh.